Aquinas Sixth Form College underwent a complete rebuild programme to take an entirely fresh look at shaping student learning and support outside the classroom. FG Library were challenged to bring that vision to reality over three floors, bringing together complementary learning, support, advice and guidance services under one roof. We developed a design concept over three colour-themed floors. It works like a traffic light system. The ground floor, the ‘green’ floor, has a relaxed informal feel, with the main doors open to the student street. The amber floor is more formal and houses the Learning Support service and group study rooms. 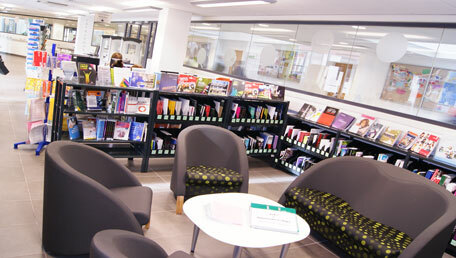 The second floor, the 'red' floor, is the main home for the centre's Science library, IT support and technical staff. FG Library incorporated the traffic light colour scheme into fascia, local seating, soft furnishings and display units on each floor. How the library became the heart of college life at Aquinas Sixth Form College. Reprinted with permission from The School Librarian.